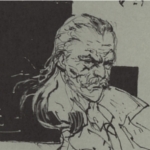 I saw some scans on this page from the mgs4 art book. Does anyone know where I can find it for a more reasonable price? You can try buying the used ones. Already checked ebay. Prices are between 100 and 200 $. Oh well, then it's time to play the lottery. Don't you just love how the Japanese site is totally different from the English one? Judging by the fact that that new studio KP wants to open in California needs a strong network programmer, I'd say there will be at least some kind of online feature.